Scooper - Technology News: Which are the fastest growing countries in Africa? Which are the fastest growing countries in Africa? Sub-Saharan Africa's positive economic outlook has come under pressure from changes in the global economy. 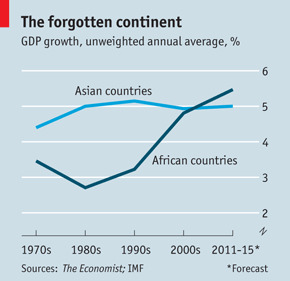 The continent's overall growth is expected to remain just below 5% in 2016. Nevertheless, there are some economies that are not only weathering the storm, but showing steadfast determination to innovate and grow. Africa.com has built the below chart to show the promising growth of six sub-Saharan nations over the next two years. The Ethiopian government has been investing in its mainly agriculture-based economy. While coffee remains its major export, there are high hopes to expand into manufacturing, textile and energy. The predictions for Ethiopian GDP have it hovering around 10% for the next few years. One of the largest challenges, however, will be to ensure that all of this growth finds its way to one of the lowest per capita income populations in the world. The DRC will have a bright future, if it can seize the opportunities stemming from its abundance of natural resources. Current projections show that GDP growth stands at 8.50% in 2016 and could possibly reach as high as 9.00% in 2017. Cote d'Ivoire is highly dependent on farming. In fact, roughly half of the entire population is engaged in agriculture. The world's largest exporter of coca beans is highly sensitive to global market prices and climate changes. The nation's GDP is expected to hold steady just above 7.50% for the next few years. The challenge will be to capitalize on that opportunity. Over the past decade, Mozambique has seen an average annual growth rate of 6-8%. That success, due in large part to investment in natural gas, coal, titanium and hydroelectric production, looks to continue with projections of 7.3% in 2016 and 2017. Gold production and tourism have helped to prop Tanzania's economy into fifth place. There have been great strides in telecommunications, banking, energy and mining. Agriculture, nevertheless, remains a dominant force, employing 80% of the work force, providing 85% of the country's exports and accounting for more than a quarter of the GDP, which is predicted to hold steady at 7.10% over the next few years. The host nation of this year's World Economic Forum on Africa has been undergoing a process of "dramatic transformation" since the 1994 genocide. While much of the country remains dependent on subsistence agriculture, Rwanda boasts a rapid GDP growth helped in part by government reforms and improved business conditions. Notably, Rwanda also scored 6th overall in the World Economic Forum's Global Gender Gap Report in 2015. Have you read This is how sub-Saharan Africa can benefit from innovation How the world's largest companies can help Africa's farmers Can agricultural development boost Africa's economy?